Between 1951 and 1982 Ralph Russell headed Urdu teaching at SOAS ( School of Oriental & African Studies, University of London.) He produced extensive and unusually effective language learning materials, which were internally published in SOAS and are regrettably no longer in print. From the early 1970s he pioneered short courses for adults in multicultural cities across the UK, and the teaching materials he trialled in these courses are brought together in A New Course In Urdu and Spoken Hindi. Dr Alison Shaw and I are in the process of producing an on-line edition. If anyone with IT experience can help with this, we’d be very glad to hear from you. Ralph also did a great deal to encourage teachers in linguistically diverse schools in the UK to value the the languages of their pupils, and worked with education authorities to persuade schools to teach them. 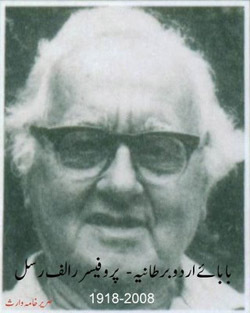 He and several of his ex-students trained teachers on appropriate methods of teaching Urdu to pupils in this context. Sughran and I were both students of Ralph’s, and taught alongside him. This teachers’ guide draws on what we learnt from him, as well as on our practical experience as language teachers and teacher trainers. Languages in Schools includes a chapter by Ralph and myself, arguing the case for teaching the languages of Britain’s minority communities in schools. Both published by the Centre for Information on Language Teaching, London.